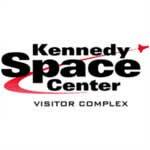 Orlando vacations are not complete without a trip to Kennedy Space Center Visitor Complex. Just east of the most popular Orlando attractions and theme parks, NASA's launch headquarters is the only place on Earth where you can tour launch areas, meet a veteran astronaut, see giant rockets, train in spaceflight simulators, and even view a launch. Watching a Shuttle launch or even a rocket never loses its "WOW factor"
Get there early and maybe mix your day with a day at Cocoa Beach. Take your own food, Kennedy Space Center can be expensive. Parking is included with admission price. Strap in for the sights, sounds, feelings, and excitement of a vertical launch in mankind's most complex vehicle. Your exploration of NASA's launch headquarters traverses an amazing area that includes towering launch pads, huge rockets, history-making technology, and vast stretches of our Florida wildlife preserve. In two giant IMAX® theaters, the dream of spaceflight comes alive with a wall of sound, five-story screen and realistic 3-D special effects. The daily Astronaut Encounter briefings allow plenty of time for discussion, so bring your questions – and your camera. Come live the human side of space at the U.S. Astronaut Hall of Fame®, complete with the sights, sounds and experiences of the famous astronauts who first ventured into the frontiers of space. Step into a world of exciting possibilities as you are inspired to be a part of the NASA mission through a live, interactive show and hands-on exhibits. Dramatic lighting brings historic NASA rockets back to life with an adventurous and patriotic scheme, highlighting each fuselage with brilliant white uplight, bathing the site with techno-blue accents and heating the engines with flickering red orange light. Here, in a spacious facility featuring a real Saturn V rocket, the Apollo program returns spectacularly to life. The 60 foot-tall Launch Complex (LC) 39 Observation Gantry provides a breathtaking 360-degree view of the two giant Shuttle Launch Pads, 39A and 39B. In the Space Shuttle Plaza, guests are met with a jaw dropping, full sized NASA Space Shuttle replica – Explorer. The Astronaut Memorial honors the 24 U.S. astronauts who gave their lives for space exploration. Adventures await “junior astronauts” at the newly redeveloped Children’s Play Dome. Highlighting the Mercury and Gemini space programs, this facility features artifacts from the first manned space flights and houses the original Mercury mission control consoles. Experience the powerful and stunning imagery of the Hubble Space Telescope at Kennedy Space Center Visitor Complex during the Eye on the Universe: The Hubble Space Telescope exhibition.